The two artists I’m using as inspiration for my final project are Kynd and Luke Twyman. Kynd’s “At First” are vivid watercolor visuals that they created for a VJ set for the musician Yaporigami. The visuals interact with the music to create beautiful painterly strokes that consume the and transform within the space. I love the feeling of the visuals and the way they move within their constraints and interact with the music. The other piece is Luke Ywyman’s interactive design for the Helios’ album “Yume”. This interactive design is interesting to me because it gives the viewer the ability to interact both sonically and visually with the work and therefore feel they are also contributing and adding to it. I found these two interesting animations on Vimeo. The first one, interactive Starry Night has the stars moving according to the brush strokes. Also, the flow and the music responds to finger touches on a screen. It is creative because the animation itself is telling a story which a drawing cannot. It is dynamic and fun. In addition, the interaction allows the user to “interrupt” and take control of the story, making a personalized “Starry Night”. The second project, The seed, is an animation that uses simple geometry and some stop motion art on paper. It tells a story of an apple seed travelling and growing. The second project is not interactive, but it has multiple scenes with the main object as a center focus. I am interested in both of them, and I am going to make an interactive animation using simple geometries and try to tell a story with several scenes. A project that I really found interesting and that pertained to project is one by Bjork Digital. The project is very short but consists of a man moving around and colors, lights, and animations are moving around and seem to react to the way that he moves. The reason why it relates is because initially I was going to include a camera in my project that reads the positioning of your hands based on the lighting. 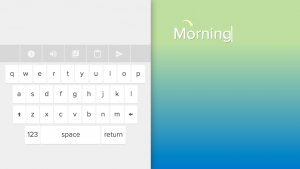 So instead of pressing a key on a keyboard to make the bars rise to the top, you could kind of raise them to the top by yourself like the text rain letter project. The other project that I found interesitng and that pertained to my project was Masaki Fujihata. This project was supposed to take a camera and focus on a specific object until a video came to life with the object that you were focusing on. Going back to my want of using a camera in my project, this could be a really cool interaction between the characters I am using and the person who is playing the game. Unfortunately I do not believe that I can recreate anything that this project has demonstrated. The first project I looked into is a transforming architectural installation named Suspès, made by by MID, PlayModes, and David Sarsanedas. It is based on the suspension of 100 helium ballons with 90 cm diameter with inner LED and control systems inside. By turning them on and off synchronically with the music, the installation simulates the apparition of stars and constellations that beat in a big aerial choreography. With the form of balloons, The installation can be held outdoors or indoors, and it includes architectural lighting for the sur- rounding buildings, which synchronizes seamlessly with the balloon matrix. These two project inspired me to explore the possibility in the sound visualization area and I beginning think of making sound graphic animation interact with sound track which sound be project into different architectural space to receive different effects. For this week’s Looking Outwards, I looked at two examples of games that are are similar to what I hope to create for my final project. Both games were created by primarygamesarena.com and were originally intended to be educational math games for younger children. The first game was called Apple Catch, and the second game was called FrostBite. The main elements of these games that I gained inspiration from was that the graphics were simple but still effective, and both games were mouse interactive and had an element of keeping tracking how how many “items” that the mouse-controlled character caught. In the background of both of these projects, there were random graphic elements, which is something I may consider adding. As I go about working on my project, I think it will be helpful to come back and look at these games again. 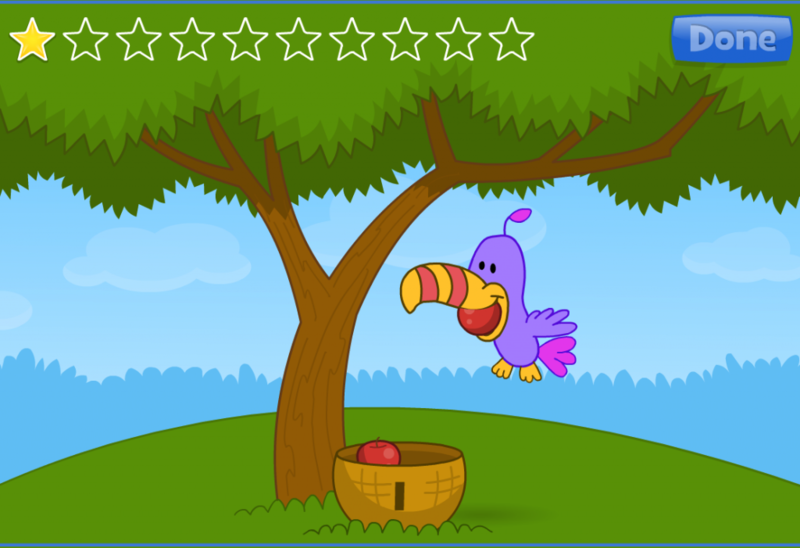 Apple Catch requires that the player moves the mouse to where is apple is dropping. FrostBite has a similar idea as Apple Catch, but it requires that the player moves the mouse away from randomly generated elements dropping from the sky. One of my inspirations for my final project comes in the form of online kids’ books. I have young cousins who are learning how to read. Instead of practicing how to read with paper books they I did, they instead are learning how to read online. Education.com has many books online that help kids learn how to read. While I want to add an interactive aspect and my story will not be for small children, I realized that this approach to reading might make adults who may not like to read enjoy it more. For the interactive part, I remembered a game from back when I was in fourth grade Spanish class. 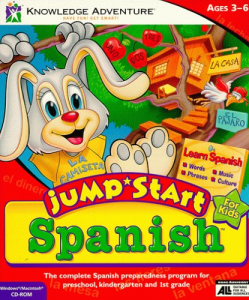 It was Jumpstart Spanish and I remembered how the game made me want to learn Spanish. Conceptually it was similar to clicking and dragging which are things that I want to incorporate to make reading fun. Since I’m using Mario as a sort of model for my project, since it is the game that made platformers what they are, I wanted to discuss Mario. I wanted to then compare it to another similar game, and since Mario is a professionally made game it seemed unfair to compare it to an indie game. The original Mario Bros game was released in 1983, so I decided to compare it to Zelda II:The Adventure of Link (released in ’87) since it’s also a platformer developed by Nintendo in a similar time period. Both the original Mario game and the second Zelda game were created by Shigeru Miyamoto, Miyamoto designing the former and producing the latter. Mario originally came from the game Donkey Kong. Mario, while it was original at the time, has become sort of the standard model for platformer games. Zelda II was completely different – while it is still essentially a platformer, the original Zelda was not, where instead you looked down from above (a top-down game like in Pokemon). Because of all the changes to the game – most notably how it was a side-scroller, included “lives” similar games like Mario and Sonic, and the inclusion of experience points – it ended up being not particularly well-received. While I’ve played the original Mario, I’ve never played the second Zelda game. However, I do admire the risks they took in changing the Zelda series so drastically. Because of the reaction these changes wouldn’t stick, but I still found their bold choices to be inspiring. I also happen to prefer side-scrolling games to top-down, so I may be a little biased. Mario, while again very “typical” of platformers, is still extremely fun and extremely difficult. While the gameplay, like all early 8-bit games, is rather simplistic, it’s still a very hard game to beat. There’s no ability to save, you can’t go back once you’ve left a certain area, and there’s a ton of levels that increase in difficulty. It’s quite impressive to me to see that this game completely stood the test of time. Sure, new Mario games are fun, but I think that the original is the best designed out of the ones I’ve played – I usually only play the later games because they’re easier to beat and I’m terrible at video games. I have decided to work on something similar to Patatapfor my final project. So I decided to look at Patatap and a similar creation named Typatone. Patatap creates unique sound and visual when a specific key is pressed, whereas Typatone generates special tones when as the user types. Both are interesting projects in that they bring uniqueness and unpredictability in user experience. Patatap may have been better if there is a clearer indication of which key is pressed so that when users try to create a composition or sound combination they can better utilize their knowledge on which key produces which sound and visual. On the other hand, Typatone may be improved by changing font color or add more visual variations to it. Overall, I really like the idea of Patatap and Typatone as they bring in more variability and color to everyday lives. ELIZA was essentially the first artificial companion computer program. Weizenbaum created ELIZA to act as an artificial therapist setting up the program to have certain rules to apply to certain phrases so that the program responds in a way that appears natural and human. Weizenbaum claims that his intent with ELIZA was to create a parody of “the responses of a non-directional psychotherapist in an initial psychiatric interview”. Mountain is a “mountain simulator”/”relax em up” game. The only controls the player has in the game is to shift the camera and the rest of the gameplay is simply watching what happens to the mountain in the center of the screen. While there are many varying opinions on the game, critics often compliment its ability to invoke a stroke emotional response from players about this inanimate object. What I admire about both these projects is there experimentation with emotional human response and the questioning the concept of caring. However, they do this in two very diffrent ways. ELIZA is mimicking and commenting on real life (more specifically a failed mental health system). Weizenbaum was actually disturbed by the response that ELIZA was considered “alive” by many people. ELIZA brings up questions of sincerity and the player’s need for a caretaker. While Mountain is actually cultivating an experience that unlike what the player has experienced in either real life or a video game. Mountain challenges the current definition of games and also the “active” role of a player.